Giftster's Suggested Item feature, available now, enables members to secretly add gift ideas on other member's wish lists. The Suggested Item feature is one more example of how giftster continues to expand ways to connect family members around gift giving occasions, says Giftster Founder and CEO, Ron Reimann. Giftster, the fast-growing wish list sharing service for families, today unveils Suggested Items, the option to add gift ideas to other member's lists, hidden from the member. Suggested items are gift ideas that one member can add to another member's wish list. For example, a sister could add a gift idea on her brother's list, hidden from her brother, but everyone else shopping that list can see it. The result is more surprises at the gift opening, and more fun and satisfaction that everyone received gifts they really needed or wanted. Suggested items just released across the whole giftster platform, including the full featured website at http://www.giftster.com, mobile browser edition https://m.giftster.com, and version 5.0 of the apps for Android in Google Play and Amazon App store, and for iOS in the Apple App Store. “The Suggested Item feature is one more example of how giftster continues to expand ways to connect family members around gift giving occasions," says Giftster Founder and CEO, Ron Reimann. "Families make giftster part of the fabric of their lives, with most members joined in a giftster group. Giftster is the one central place they can save gift ideas, or find gift ideas on other family member's lists, for holidays, birthdays and other events." Giftster gives a group creator the tools to form a permission based group of members. Once set up, each member can view each other's wish lists, and mark items reserved or purchased, avoiding duplicate gifts. 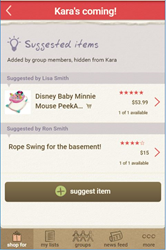 Now with suggested items, a member can append additional gift ideas onto lists in the group. Suggested items are hidden from view of the list maker, but others shopping for that person can view them. This adds a satisfying, new dimension to wish list making. Now members can add thoughtful gift ideas to other people's lists, and enjoy seeing someone select the gift they suggested and delight the recipient. All the suggested items added by a member on different lists are conveniently displayed in one place in their my list page so they can update or delete them as desired. Minnesota-based Giftster defines the standard for online year-round, lifetime gift registries for families and close friends. By combining family-friendly features and the latest web and mobile technologies, Giftster is the go-to choice for a shareable family Christmas registry, birthday, wedding or baby registry.